SOUTH BEND, Ind. 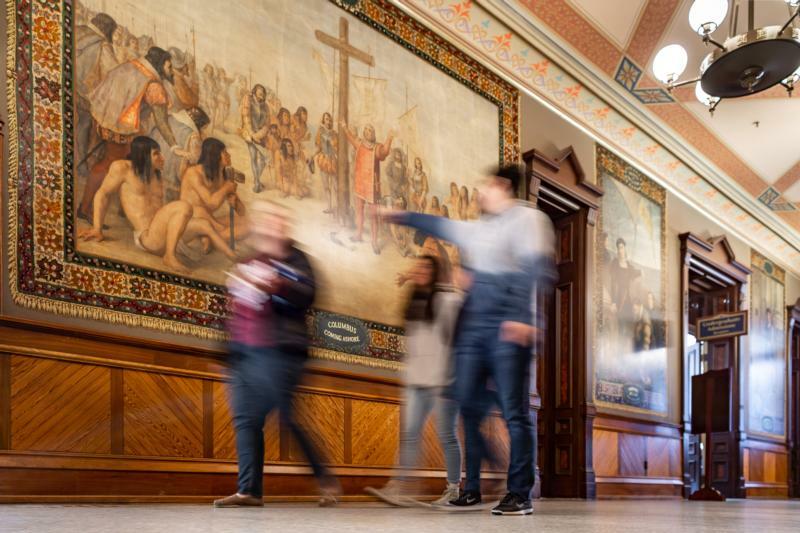 (CNS) — The president of the University of Notre Dame in South Bend announced that in consultation with other school officials, he has decided to cover 19th-century murals in a prominent campus building that depict the life and exploration of Christopher Columbus. The works by Luigi Gregori that adorn the building’s ceremonial were painted in 1882-84, not long after a devastating fire and reconstruction” of the structure, Holy Cross Father John I. Jenkins, wrote in a letter to the campus, released a day before Martin Luther King Jr. Day Jan. 21 and was the university geared up for its annual Walk the Walk Week in honor of the holiday. So the murals will be covered by a woven material “consistent with the decor of the space, though it will be possible to display the murals on occasion,” he continued. The paintings themselves cannot be moved because Gregori painted them “directly on to the plaster of the walls, and so any attempt to move them would damage and likely destroy the works,” Father Jenkins said. “However, because the second-floor hall of the main building is a busy throughway for visitors and members of the university community, it is not well suited for a thoughtful consideration of these paintings and the context of their composition,” Father Jenkins said. Columbus was hailed by Americans generally as an intrepid explorer, the “first American” and the “discoverer of the New World,” he said, and the murals depicted the popular image of Columbus as an American hero, who was also an immigrant and a devout Catholic. The message to the Notre Dame community “was that they too, though largely immigrants and Catholics, could be fully and proudly American,” he said. Showing Columbus “as beneficent explorer and friend of the native peoples hides from view the darker side of this story, a side we must acknowledge,” Father Jenkins said. The goal now is “to respect both Gregori’s murals, understood in their historical context, and the reality and experience of Native Americans in the aftermath of Columbus’s arrival,” he added. As a Catholic why would I ever support an organization that supports what is tantamount to book burning? What’s next supporting those offended by every religious painting by master artists found in every musuem in America. Nortre Dame’s actions in covering what may offend some is not only entering a slippery slope, but an affront to our forefathers who guaranteed us liberty.